This logo-inspired combo of African and Indonesian coffee is bright, rich, and like all of Caffe Fresco SCR's coffes, smooth! 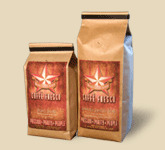 Red Star Blend is a delicious blend and a true classic for all brew methods. It's a must try as a milk-based espresso beverage!